If you are a photographer, then you should be familiar with the term "depth of field". However, most modellers probably would not. What is 'depth of field'? Depth of field is referring to the length of area where the objects will appear acceptably sharp in the photo. Most lenses have focusing distance. If an object is exactly at the point of focus, then it will appear sharp in the photo, commonly said as: "in focus". But if the object moves farther away from the point of focus, either closer to the camera or farther, then that object will gradually become blur, commonly known as: "out of focus". Technically, depth of field is calculated using mathematic equation derived from Zeiss Formula. But to make thing simple, we will not dig further into its mathematic. The most important control in the camera which affecting depth of field, is the aperture control (sometimes also called f-stop, or diaphragm). The setting is usually indicated by numbers, like f/4, f/5.6, f/8, f/11, f/16, etc. BR-18 locomotive pulling Rheingold passenger coaches. The upper two photographs were taken using Digital SLR, while the lower two photographs were taken using Compact digital camera (1/1.8" sensor size). As we can see, the lower the f-number, the less depth of field it will have. While higher f-number (sometimes also called as "smaller aperture") will give more depth of field. From the above photographs, we can also see that the Compact digital camera gives more depth of field for the same aperture as compared against Digital SLR. This is due to the size of camera's sensor. The smaller the sensor, the more depth of field it will give. This is clearly an advantage for macro photography, as demonstrated on the photographs below. The above photographs, shows a 1/87 scale VW Beetle which is less than 5 cm long, demonstrate that compact digital camera produce much deeper depth of field at the same aperture as compared to APS-C digital-SLR. The depth of field at f/8 is almost similar to SLR at f/22. So what is the big deal about it? At f/22 the camera needs more light than at f/8, thus forcing us to either increasing the ISO rating or shooting at slower shutter-speed (longer time), or using much brighter lighting to illuminate. Both the raising of ISO rating and slower shutter-speed will contribute in increasing the noise level. Therefore a compact digital camera has an advantage in this sense. The depth of field may not be an issue in common photography until you go into macro. 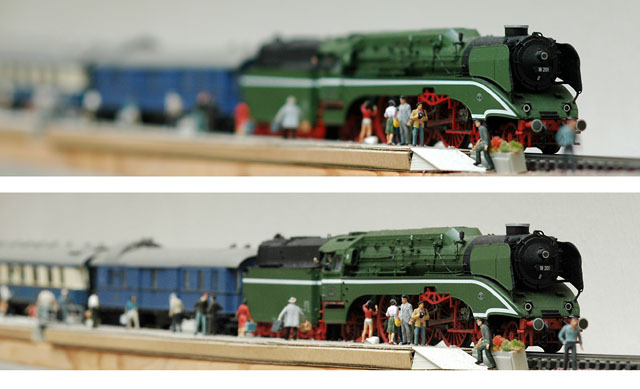 As you start taking pictures of tiny details of your miniature models, then the depth of field will start to be an issue. Generally you want a greater depth of field to make the whole model appear sharp. So as a basic rule of thumb: set the aperture as small as possible (highest possible f-number). Usually you will need brighter light to allow that, or slower shutter-speed (always remember to use tripod in any macro photography). If you are using slow shutter-speed on a tripod, it is advisable to use the camera's self-timer function. This will avoid vibration caused by the pressing on shutter button. The above photograph was taken using a macro lens with slow shutter speed of more than 1 second, at aperture f/22. The objects are 1/35 scale Flak 88 mm amunition. 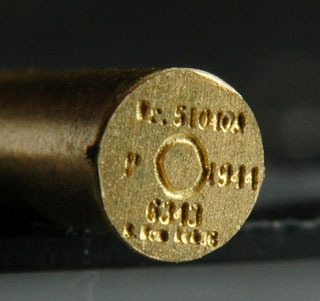 The size of those cartridges in 1/35 are just 3 mm in diameter. As you could see, the macro lens magnifies its size, the same way as if you're looking thru a magnifying glass. Focus was set at the bottom plate, but even at f/22 the shell heads are still blur, out of focus. So again keep in mind, that in macro photography, the depth of field is very shallow, you need to use the highest possible f-number to increase it. But that will need brighter light, slower shutter speed, or higher ISO rating. Those are compromises. 1/87 scale Wurttemberg Class-C 1910 locomotive. This photo was taken with very small aperture (highest f-number). 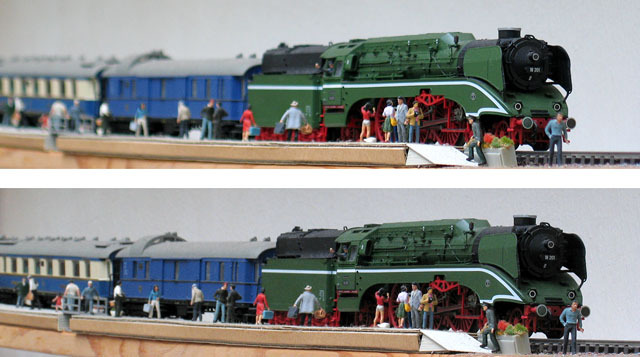 The high f-number gave a wide depth of field, although its cab and tender carriage is still out of focus. Generally speaking, all photographs taken from the corner of a slightly long miniature will exhibit certain degree of blur (out of focus). In Chapter 10, we will look into the usage of "focus stacking" technique to alleviate depth of field problem.